Sometimes when you have a lot of something, it can begin to feel a bit samey. I read lots of children’s books, and there are moments when themes that are topical or zeitgeisty occur a little too often and the topic begins to feel a bit staid. It’s probably like eating a lot of chocolate. If it’s readily available and you eat it for breakfast, lunch and dinner, it can taste a bit mundane. But if you live under a strict regime in which chocolate is more or less forbidden, just one taste can be electrifying. When I opened Candy and started reading it, it was like eating chocolate again after a 12 week hiatus; it was a breath of sweet fresh air. The press release announces that this book is Bugsy Malone crossed with Charlie and the Chocolate Factory. I like to think it’s a conversation between Raymond Chandler and Willy Wonka. Or Jessica Rabbit set in Cadbury World. Lavie Tidhar has written a detective story in film noir style based around the prohibition of candy. And it’s superb. Nellie Faulkner is a child detective, living in a city in which sweets have been forbidden under the new mayor and his Prohibition Act. Roaming the unsweetened mean streets are gangs of candy bootleggers, all smuggling in sweet treats, eating their booty and making money. When gangster Eddie de Menthe’s teddy bear goes missing, Nellie has a case to solve. But when the teddy shows up and Eddie himself disappears, things turn serious. “’Can we get some cake, boss?’ Gordon said. His friend nudged him in the ribs nervously. Waffles’s hand came crashing down on the folding table before him, sending plate and spoon and crumbs flying in all directions. The book is funny, but also zings along with a great cast of characters and an excellent plot. Of course, with any book about sweets there are bound to be Charlie and the Chocolate Factory allusions and there is great fun to be had spotting them, and even more fun as the adult reader spots the film noir allusions too. But in the end, despite all this fun, this is a children’s book with heart. The book explores doing the right thing, and overcoming bullies, and is engaging, warm and topical. A mayor whose slogan is ‘Eat Your Greens’ with supporters throwing celery sticks in the air, is of our times. The publisher has employed Mark Beech to supply illustrations throughout, and happily they are quirky, and slightly zany, beautifully matching the text style. 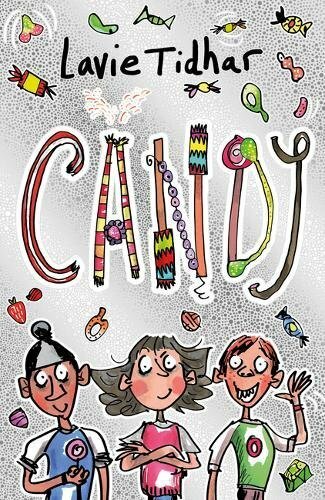 Candy may be Tidhar’s first novel for children, but it’s easy to tell it comes from an accomplished award-winning author (for his adult titles). Let’s hope there’s more to come for children – they’ll crave it more than chocolate (well….maybe). If you’re an adult, and want a sample of Tidhar’s bizarre film noir mind, go read his Winnie the Pooh thread on his twitter timeline. You’ll never see 100 Acre Wood the same way again. And buy your own copy of Candy here – it’s a golden ticket of children’s books.